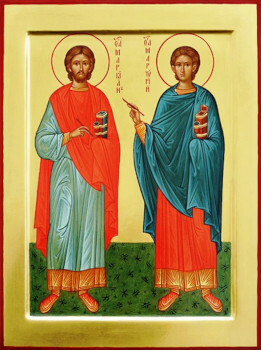 The Holy Martyrs Marcian and Martyrius served in a Constantinople cathedral. Marcian was a reader, and Martyrius a sub-deacon. They both likewise performed duty in the capacity of notaries, i.e. secretaries, for the Patriarch Paul the Confessor. Arian heretics expelled and secretly executed the righteous Patriarch Paul, and his cathedra was given over to the heretic Macedonios. The heretics attempted to entice Saints Marcian and Martyrius over to their side by flattery, they offered them gold and promised them cathedras as archbishops. But all the Arian efforts were in vain. Then the impious threatened to slander them before the emperor, and sought to intimidate them with torture and death. But the saints steadfastly confessed Orthodoxy, as handed down by the fathers of the Church. Marcian and Martyrius were sentenced to death. After their prayer, the martyrs with quiet rejoicing bent their necks beneath the sword of the impious (+ c. 335). Their holy bodies were reverently buried by Orthodox Christians. Later on, by decree of the holy Bishop John Chrysostom, the relics of the holy martyrs were transferred into an especially built church. Believers here were healed of many infirmities through the prayers of the saints, to the glory of the One Life-Originating Trinity.